There are many reasons you might want to make a recording of your ‘ukulele playing. Having a memento of your work is great for sharing with family and friends. It’s also FUN and can be a huge testament to your efforts a few months or years down the road when you hear how much you’ve improved. These days it’s easier than ever to create a high-quality recording. With the advent of computers and their companion technologies, literally anybody can freeze his or her music in time on a hard drive. Because this is, by far, the most popular means to record ‘ukulele, I’ll only cover computer-based recording in this tutorial. If you have a stand-alone recorder of some sort, the process will be similar, but refer to the manual to make sure. The source is the most important part of the recording. This is the ‘ukulele itself or your voice or the 60-piece orchestra at Carnegie Hall. 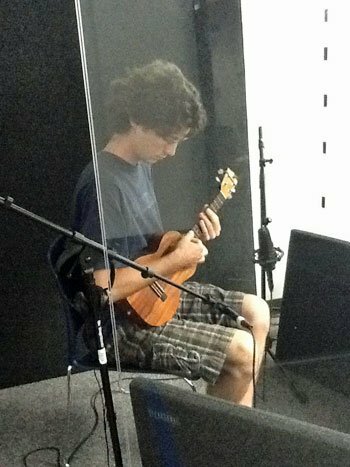 My ‘ukulele-wiz roomie in the recording booth. I want to say he only played one take here to get what he wanted. Preparation is vital to successful recording. So practice your song a lot. If you’re at home, recording in your basement, time isn’t a factor, but it used to be that time was money in a professional studio; don’t practice in the studio. I’ve found that being practiced up on a piece makes the recording process much more enjoyable and less stressful. If you’ve been practicing the piece perfectly, you should, theoretically, be able to play it perfectly while recording. If you weren’t ever able to play it right in practice, the odds are it’s not going to magically “fall out” onto the tape. Make sure your ‘ukulele is in tune. This may seem obvious, but I’ve heard a lot of amateur ‘ukulele recordings that sound bad because the E string was flat. Wear quiet clothes. If you make noise when you move, the mic will pick up the sound. You don’t want to run a marathon when recording, but it’s very uncomfortable to have to force yourself to sit stock still for 4 minutes while you play the song, worried that you might ruin the take with some noise. Sit in a quiet chair. Wooden ones with tight joints are best. No moving parts, please. Lastly, try to find a quiet place to record. Internal rooms that don’t have walls that face outside are great. Try to get as far away from loud noises as possible (road, refrigerator, neighbors, etc…). Carpet helps dampen a room’s self-noise and reverberation (a good thing, usually, for amateurs). You don’t need much to record these days, but what you do need is pretty specialized. 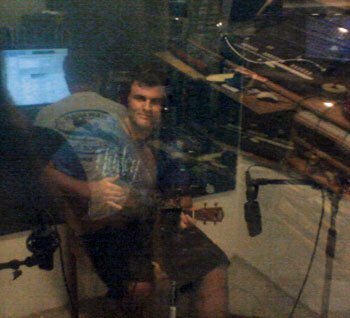 An ‘ukulele is a tricky beast to record well. You’ll figure out what sounds best with your ‘ukulele if you experiment, but here are some starter tips. An example of a good starting mic placement. You’ll need a mic stand to position the mic where it picks up the sound best. Nothing affects the sound of your recording quite as much as mic placement. I spent hours and hours playing with mic placement when I recorded my EP. Left, right, up, down, over my shoulder, under my chair, on my side-sound-port, etc…! But once you find the sweet spot, it’s hard to mess up the sound. For recording my ‘ukulele, I found that the best mic placement was about a foot away from my 9th fret and angled towards where the neck meets the body. Start here for quick results and when you feel like it, try moving the mic and listening to what happens (your eyes mean nothing when you record!). While some microphones have USB plugs for easy setup, most mics still require an XLR cord and a way to get the signal into the computer. The box that makes this transition is called an interface. An interface can be as simple as an input jack or it can be a do-it-all unit that controls gain, routing, and monitoring. This is the type most people use because it allows you to control everything the computer isn’t well served at handling. Thing to consider when selecting an interface should include whether it supplies phantom power – necessary for most condenser mics, the amount of gain it produces for quiet signals, and whether it can accept both XLR and 1/4″ signals. These all depend on your needs, so be sure to do you homework and get something that will work well with your hardware and/or give you room to grow in the immediate future. In my experience, audio recording doesn’t take that much computer power until you start rendering tracks or adding effects. But be sure you have at least the minimum requirements on the DAW’s box. Testing mics and positioning in recording class at the IHM. Once you have an interface plugged into your computer, you have to have someplace to send the signal. 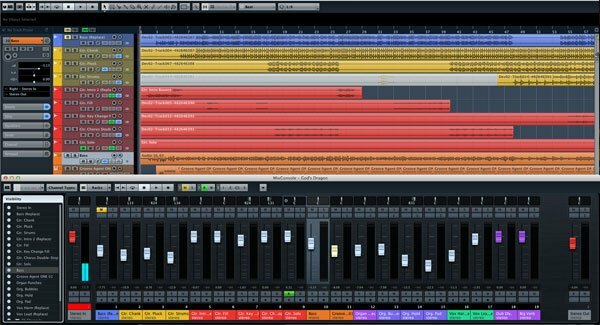 This recording program is called a DAW – digital audio workstation. It handles making your computer talk to the interface and allows you to create tracks for each input source, along with mixing, editing, and much more. In the old days the DAW would be replace by the recording console with a million little knobs to control the sound. Now each lives a click away. There are many, many DAWs. Which one you choose totally depends on your operating system, budget, and needs. The go-to, bare-bones freebee is Audacity. Does the job without looking pretty or being easy to use, but if you’re strapped for cash, it works. There’s also free versions of MuLab and PreSonus Studio One 3 Prime for Mac and PC. If you’re on Mac, Ardour looks like a great option that can be had for as little as $1 (pay-what-you-want). For Windows, Podium Free, might be worth a look. If you have the money, fork out for an entry level version of Cubase, Reaper, Ableton, Cakewalk SONAR, or even a yearly subscription to ProTools. These less-fancy versions can be had for around $100 and will do everything you need and more. Pick one that you like the look of. They all do basically the same things in different ways. The big difference is learning how to use each program. I use Cubase Elements because it’s what I started on many years ago. It does the job. Pick a DAW and learn its ins and outs. Before you can start recording there are some basic steps you must take to get your gear and hardware ready. 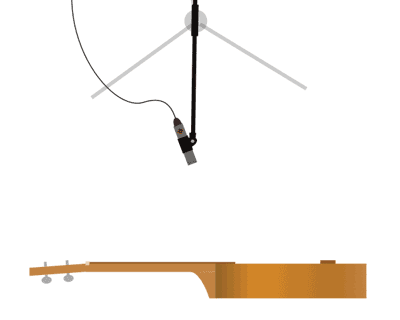 Position your mic on the stand approximately where you want it for recording and plug it into an XLR cable. Then plug the XLR cable into your interface and plug the interface into your computer. If you have a USB mic, just plug it into the computer. The hardest part about this whole process is getting your interface to talk with the computer. Hopefully it came with instructions on how to do this. Usually, you open up your system preferences and go to the sound options. Then select the interface as your new input and output (this disables your built-in speakers and mic until you switch it back). If you’re on PC, you might have to download a driver for the interface to make it link up with the computer. This is a whole ‘nother ball of wax that I’m glad I don’t have to worry about on Mac. Again, there should be instructions on how to download this little mini-program or maybe even install it with a CD. If all goes well, this should be easy. If it doesn’t, you’d better call your grandson to help you because naughty drivers are a mystery to the best of us. Once your computer recognizes the interface as the new audio source, boot up your DAW and find the Device Manager/Setup/Connections. Now it’s time to tell your DAW where to get its sound from. This can be a confusing process that requires setting in and out buses for your signal. Refer to the manual on how to do this because ever DAW handles it differently. Main thing to know is that DAWs usually treat two channels as a stereo pair. Even if your interface has two separate inputs, they usually appear as “left” and “right” under a heading “stereo 1” or something similar. All directions given for DAW actions from here on out are generic. It might be different on your program. Refer to the manual whenever you can’t figure something out. You can learn a lot about a program quickly by looking up your questions! Basic keyboard shortcuts are GREAT! At least learn how to play/stop, rewind to start, and record via your keyboard. It saves lots of time. What you need is a mono track to capture the audio from one of your interface inputs. To make this, go up in the menu bar and find “add audio track” or “basic audio track.” Create it and look at your first blank music playground! Now we need to set it up. In track settings, choose the correct input source from the interface. If your microphone is plugged into channel 1, select channel 1. Simple. Now, time to get the track monitoring itself. Usually on each track there is a way to listen to the input source. This is called monitoring. Locate the monitor button or select the track (for instance, in GarageBand, selecting the track turns on the monitoring for that track). You should now be able to see a level meter light up when you clap in front of your mic (depending on the gain). If you are monitoring through your DAW, you should also at this point be able to hear what the microphone is hearing. The reason you do this isn’t necessarily because you need to hear the source to record (in fact, this can cause problems, as shown later), but monitoring the levels visually on the meters helps you really dial in the next step. Gain is the amount of signal that hits the front end of your interface and computer. You want to get as much volume as possible without clipping (overloading or distortion). In the old days you could push analog recording equipment with too much gain and it would sound nicely crunchy (think the Beatle’s Revolution), but digital distortion sounds nasty and fizzy – not desirable at all. Use the knob on your interface or, less ideal, in your computer settings if you’re using a USB mic, and turn it so that the meter in your DAW stays just shy of the red when you’re playing or singing your loudest. Even if the rest of your performance is quiet, all it takes is one volume spike to clip and ruin your take. So set the level accordingly; better safe than sorry. It’s pretty easy to reclaim any volume you might loose via inefficient gain. So aim a little low until you get a feel for toeing the line. Since I’m a one-man show and usually have my computer at a distance to avoid picking up its running noise on the mic, I will often hit record, play a sample take of my track and then go back and check the wave spikes and adjust my gain using the visual representation from what I just played. If you’re going to use a click track, now is the time to set it up in your DAW. A click can be very helpful for keeping on time and allowing you to overdub other instruments and ‘ukulele tracks easier. Using a click is only something you should do if you’ve practiced with a click. It’s a separate skill that needs time to develop and is useless if you’re off by even a little bit. You’re almost ready! Last thing to do is to press the record-enable button so that when you hit record, the DAW will actually record onto the track! Record enable is a great tool for when you’re overdubbing – you can leave previous takes untouched and record new stuff on fresh tracks – but it will trip you up when you forget about it. Without record-enabling your tracks you won’t record anything and are essentially playing back your song. It’s time to finally sit down and record something! Set up is done, the song is practiced, your ukulele is in tune – it’s time to track. Set yourself up in your quiet chair, finalize the mic positioning and press the record button! Take a few bars of silence to get in the “zone,” then begin your song. When recording it’s really easy to get caught up in the pressure and over-think the situation, but it’s best just to play as normally as possible. Don’t try and do anything different than you’ve been already doing in practice. If you need to play cleaner, practice it cleaner. Don’t try and force out a perfect performance – you’re just trying to capture it. When you play the final note or chord, stay quiet and don’t move to let the sound fade out naturally without any other noise. A perfect take can be ruined by a small noise on the fadeout. It’s always easy to edit out this natural decay, but impossible to put it back in if you want it. If you like what you played you can call it quits, but if not you can do another take. Most people do several takes to find the one that is the best. Congratulations! You’ve now got your first track. That could be it, or you can expand upon your song by overdubbing. Overdubbing is when you listen back to what you’ve already played and record another piece on top of it. To do this you create a second track so that the original remains untouched. This is how you would add a bass track or vocal track later. The thing with monitoring is that it can create something called latency. Latency is a slight delay between what is played in what is heard. It’s created by computer processing as the sound is sent into the computer, recorded, and then sent back out the headphone jack. Latency can make it almost impossible to play in time so it’s a serious problem. The faster your computer is, the less latency there should be as it processes the sound, but even a lightning-fast machine will still have a little (it might not be noticeable). To combat latency, most interfaces have a built in headphone jack that can pan between direct input monitoring and monitoring from the computer. It’s only the processed signal from the computer that has latency. When overdubbing, the best way to monitor is to make the previously recorded tracks in the DAW play back while using direct monitoring for what you’re currently recording. You don’t want to monitor via the computer the track you’re recording. To overdub, all you need is a new track. Create one and disable recording for your old track and enable it on the new one. (This is super important! Otherwise you’ll overwrite what’s on the old track! “Undo” if you ever make this mistake and the computer should revert your old track back.) Then record. Tracking the overdub should be very similar to tracking the original piece. The only difference is you must listen to what you previously played to keep your timing correct. If you jam with people a lot or play in a group, this shouldn’t be a problem. But if you’ve never played with anybody before it will be a new skill you have to develop. Repeat until you have all the overdubbed tracks you want! One of the hardest things about overdubbing is coming in and starting at the right place. A click track makes this way easier because you can hear the tempo and sync your playing according, but if you’re not using a click you’ll have to guess. Or you can create a fake count-in on a separate track. This is why you hear people say “one…two…three…four…” at the beginning of a recording: to make sure everyone comes in a the right place (then or later). If you forget to do so you can overdub this count to get an idea where the song starts. Something as simple as clapping four beats along with the song and then moving it forward in time can become your tempo cue. Computers are great, but there are also some cool options for recording on a mobile device too these days. First off, you need a recording app. GarageBand does a lot and has other fun goodies like virtual drum kits and keyboards. Depending on your stock suite of apps, you might already have it or be able to get it for free. For a more recording-specific app, Multitrack DAW is a great option. It’s $10, but has many options for creating a high-quality recording – a much more serious tool than GB. Then you need an interface. There are fancy dock versions that allow you to record multiple tracks at once, but I used an Apogee JAM for almost all of my iPad recording at IHM. So simple, yet so powerful if you have a good pickup in your ‘ukulele. If you need mic capabilities, something like the Alesis iO Dock should do the trick. But do your homework before taking my word on that specific piece of equipment. It’s been a while since I dabbled in serious iOS recording and there might be something better on the market now. The rest of the recording concepts are the same or similar, just on a touch screen. For a computer I use an iMac. I don’t love most of Apple’s policies, but their computers last way longer than PC in my experience and run consistently smoother. With music gear it’s incredibly easy to plug and play on OSX whereas PC requires drivers. As I said before, I use Cubase Elements LE 7 as my DAW. Simple, pretty, powerful. I haven’t found anything it lacks yet. I think there is a newer version out, but if it’s not broke, don’t fix it, right? 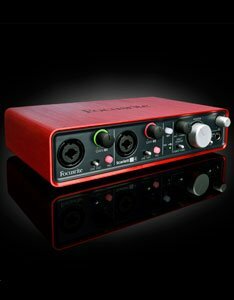 I use a Focusrite Scarlet 2i4 for an interface. It does everything I need to do for my personal projects and is sturdy and reliable. The sound is crystal clear, the mic preamps seem high quality, and there are many monitoring options I don’t even use. For microphones I’m a little spoiled. I forked out early on for some high-quality microphones that I hope will serve me forever. These have both worked fantastic and came highly recommended from James Hill and Anne Davison. I have zero regrets spending the money. That said, I certainly didn’t start with an $800 mic – I knew how to do some recording and knew I liked it enough to continue doing it for the foreseeable future. The Neumann KM184 is what I use for recording my ‘ukulele. 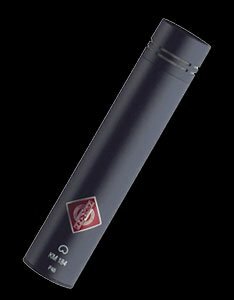 It’s about the size of a stubby cigar and is considered a small diaphragm condenser mic. I love the bright and clear sound, perfect for the high sound of the ukulele. For recording vocals, I use a Shure Beta 87a. It has an awesome flat front grill which is fun to sing against and sounds really nice for studio and stage work. There are many better options for recording vocals with some sort of higher-end condenser mic, but for the price this works fine for most of what I’m doing. Of course it’s also useful for other miking applications other than vocals. I usually bring this mic to gigs too. That’s my set up. I tend to be a little Gucci with my gear just because I appreciate the quality and lifespan that my money goes towards, but you definitely don’t have to shop the same way to get good results. If I was on a budget and already had a computer, I would probably buy a Shure SM57 and a Focusrite Scarlett Solo. This will get you out the door for about $200. You could probably do it for less, but you get what you pay for. The best way to learn recording is to do a lot of it. Record your friends and find ways to spend time lurking in other people’s studios. By being around it and paying attention, you’ll learn much. Once you get the basics dialed in, there are many great sites chock full of knowledge. I follow Graham at The Recording Revolution on Youtube. He’s got tons of videos with tips and examples of how to improve your recording techniques and mixes. Sound On Sound is a British magazine with an ever-expanding, if slightly outdated-looking, site. Lots of articles on things like acoustic treatment and how to mic vocals and guitar/uke at the same time (not as easy as you’d think!). Definitely one to poke around on. Your library will have books on the subject. If you’re not completely mortified by your experience “in the booth,” you might want to share your work. Your effort probably won’t circulate like Dark Side Of The Moon, but it’s satisfying to share your music and engage in the ‘ukulele community as a recording participant. First, you need to export your song from a HUGE .wav file to something more upload friendly. To do this, move the range selection around your whole song and click File > Export. Chose .mp3 or .aac since they are the most widely supported “lossy” file types. This will be a downgrade from the original .wav quality, but it must be done if you don’t want to wait hours for your song to upload. Give your song a filename and save it somewhere you will remember. The best place to share your work is on SoundCloud. It’s a nice, clean site that seems to be the remix capital of the internet, but also has a small, thriving collection of uke players posting their songs. Creating an account is free and uploading is easy. I’m on there as Brad Bordessa. Look me up! I always follow back and would love to hear what you record. There are lifetimes and lifetimes of study regarding recording techniques. But it doesn’t take much to jump in and start having fun making a tangible copy of your music. Now go forth and record!